Hello there, as you probably have heard October 1st (yesterday) has officially been labelled as International Coffee Day! Of course I went for Coffee on International Coffee Day as a self labelled coffee addict. I wanted to share with you guys the place I went to as I fell in love with it. Its located in the new shopping centre at Lidcombe -Power Centre, next to Woolworths. 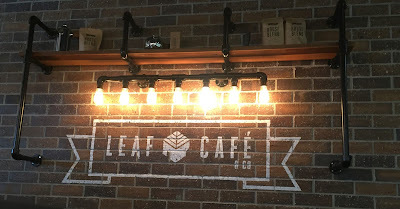 The cafe is called Leaf Cafe with an amazing interior. Its got a mysterious vibe; lit with light bulbs and has a rustic feel to it. The service was quick and the staff are friendly. The best part was that they have free wi-fi, its not much but you can still flick through Instagram. The Coffee was pretty good; very foamy. I had some muesli bites along with my coffee. They were very tasty! Hope you like this short post. How you also had amazing coffee on International Coffee Day. Don't forget to tag me on Instagram if you know any cafes I should visit.